Don't know where the start? Well this is the package for you! We will conduct budget analysis, and help you stay within your planned budget. We'll help you find a venue, and won't quit til we find your perfect one! Need vendor recommendations? No problem, we've worked with fantastic vendors in the area and will always recommend the best that fits within your needs. We'll go to every vendor meeting that you would like us to attend! It's always great to get a second opinion. Overwhelmed with contracts? Don't worry, we will look them over and make sure that you're getting everything you need! We will work very closely with your vendors throughout the entire planning process, and will coordinate that final vendor walk-through at your venue. Event design is our forte, and we'd love to be involved in this part of planning. We'll sit and chat with you about your overall vision, and how we can best achieve it! Pinterest boards, wedding mags, your wedding binder - we'll look at it all and make it happen! We will oversee your wedding day from start to finish, and will make sure your guests have a great time. Our goal is to leave you happy and with smiles on your faces, and we'll stop at nothing to achieve that goal! Have you started planning, but still need guidance along the way? We will refer any vendors to you and will help with nailing down contracts and negotiations. Event design is also included in this package, and we will go the extra mile to ensure your vision is fully executed to your expectations! Need assistance staying within your budget? We will most certainly help with this. We will start with what you have planned for and will make sure you stay within the budget. In this package, we will meet with you three times, and use those meetings as you wish - site visits, vendor tastings, favor and invitation assembly, etc. 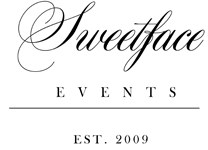 Sweetface will be your point of contact starting six months before your wedding. We will personally work with all of your vendors six months prior, in the hopes to alleviate any added stress. On your wedding day, we will be on site all day ensuring all your wedding elements have been placed out. Set up and tear down will be overseen by us, just point to the cars your items will be going in! In the Month Of Package, you will have one meeting with us a month prior to your wedding day. This meeting will be reserved for going over all your planned details - wedding day timeline, seating arrangements, vendor contracts, vendor list, wedding checklist, etc - the list goes on! We will coordinate one final walk-through of your venue with all vendors. This will be a great way to get everyone together before your wedding day to ensure we're all on the same page! On your wedding day, we will be on site for ten hours to oversee set up and tear down. If you are in need of additional hours, don't worry, just let us know! Even though we're not involved from the beginning, we do our best to get up to speed to make it feel as if we were there throughout the whole planning process. This package is perfect for the brides who want to experience all the planning themselves, and will just need us to tie up loose ends and make their wedding day go without a hitch! With the Day Of package you will have us on site for ten hours on your wedding day to ensure seamlessness. We are typically the first vendor to arrive and the last to leave, so leave all the set up, tear down, and wedding day details to us. With this package, feel free to call/text/email us anytime and we will always get back to you with all the answers you need. We will start working solely with your vendors within the 30 days before your wedding, to get up to speed with all wedding day details and will become the point person at least 14 days out. You will not have to worry about one thing! We will meet for your venue walk-through, week of decor meeting, coordination of your rehearsal, and of course on your wedding day. If you feel like this package is right for you, but think you need another meeting or two, just let us know! We are happy to customize any package to fit your needs! We'd love to come along as your planners and ensure that all your plans from afar are executed. Contact us for more information.